The Club Piou Piou of the ESF Les BRASSES welcomes your children in a dedicated area, equipped with educational accessories adapted on a specially set up space. Your children will be able to enjoy their first gliding movements safely. They will discover the snow, its colour, its softness, under the watchful eye of ski instructors experts in early childhood. The children will discover at their own pace, while having fun, the pleasure of gliding on snow, around the story of Piou Piou, Sifflote, Blanchot, Titourson and Garolou. 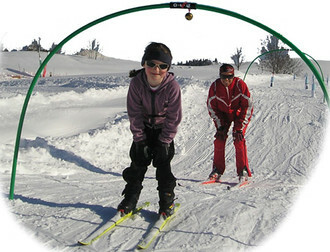 In groups of 6 to 8 children, they will slowly move towards autonomy in their movement with skis, without forgetting a snack that gives strength and the medal at the end of the course. The ESF of Les BRASSES offers group lessons outside French school holidays on Saturday afternoons from 2 to 4pm or during French school holidays from Sunday to Friday from 1 to 3pm. From the age of 4, join us on the "acrobats mountain", a safe space created especially for your children to enjoy the pleasure of their first gliding movements, their first turns, their first voluntary stops before the amused eye of the fox, the mascot of the area. For all your needs, for all your desires! Do you want your child to be accompanied step by step? Your child is just starting to ski and you want him/her to progress at his/her own pace? For further information and to book a lesson, contact us on the +33 (0) 4 50 36 61 96.